Allow us to introduce ourselves . . . The Research Centre of the Slovenian Academy of Sciences and Arts (ZRC SAZU) began its independent career in 1981, even though the majority of the institutes under the aegis of the Slovenian Academy of Sciences and Arts had already been operating several decades earlier. The period of independence was turbulent, exciting, and successful. ZRC SAZU is entering its mature period as one of the leading research and educational centres in Slovenia, and is completely comparable with the most prominent academic institutions in central and southeast Europe. More than three hundred associates are organized into eighteen independent but coordinated and interconnected institutes. Work at ZRC SZU is distinctly interdisciplinary and based on cooperation, complementation, and synergy. The diverse research areas can be summed up in the study of cultural, social, and natural phenomena, processes, and practices. The results of our work are similarly diverse. These results are visible not only in research and discussion articles, as well as general-interest publications, but also documentaries, promotional films, maps, CDs, posters, exhibitions, and websites. The research network connects . . . 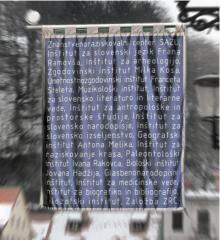 The research network of the Research Centre of the Slovenian Academy of Sciences and Arts consists of researchers working at eighteen ZRC SAZU institutes: the Anton Melik Geographical Institute, Fran Ramovš Institute of the Slovenian Language, France Stele Institute of Art History, Institute for Cultural History, Institute of Anthropological and Spatial Studies, Institute of Archaeology, Institute of Culture and Memory Studies, Institute of Ethnomusicology, Institute of Musicology, Institute of Philosophy, Institute of Slovenian Ethnology, Institute of Slovenian Literature and Literary Studies, Ivan Rakovec Institute of Palaeontology, Jovan Hadži Institute of Biology, Karst Research Institute, Milko Kos Historical Institute, Slovenian Migration Institute, Sociomedical Institute. Researchers also conduct studies at three regional research stations— the Research station Maribor, Research station Nova Gorica, Research station Prekmurje—which connect the research network across Slovenia from west to east. Our basic mission is to conduct basic research as part of national research programmes, national basic research projects, international projects, and excellence centres. ZRC SAZU also carries out a series of applied projects that exceed the narrow orientation of individual specialized areas and make possible valuable links between various institutes and disciplines. Numerous achievements prove that research findings in the humanities are also useful for preserving natural and cultural heritage as well as for finding solutions to concrete problems; the most important achievements include compiling seminal standard and technical Slovenian dictionaries, cultivating, preserving, protecting, and managing authentic elements of Slovenian natural and cultural heritage, and developing strategies for a responsible attitude towards natural, cultural, and living heritage (e.g., environmental impact studies, vulnerability studies, water-resource management, providing professional support in building infrastructure and motorways, developing methodology and prevention or intervention programmes for the mentally handicapped, and enforcing EU heritage-protection policies). These basic and applied research projects are supported by the materials that our associates have been collecting for decades as part of the Natural and Cultural Heritage of the Slovenian People programme; this programme is one of the founding tasks of ZRC SAZU, which it carries out together with the Slovenian Academy of Sciences and Arts. The research infrastructure includes ZRC Publishing House, which is the largest publisher of literature in the humanities, publishing fourteen journals (five of them listed on the Thomson Reuters indices) and more than fifty book series. ZRC SAZU research infrastructure also includes the Azil Bookstore, the ZRC Atrium events venue, and the Geographical Museum. The infrastructure supports the research activities by providing photo, video, and audio documentation, as well as laboratory services, which make it possible to analyze the data, measurements, and samples collected in order to evaluate and synthesise the research findings. Together with the University of Nova Gorica we offer several undergraduate and graduate academic programmes: The Comparative Study of Ideas and Cultures, Karst Studies, the EU Master’s Programme in Migration and Intercultural Relations (Erasmus Mundus status), and Cultural History. An independent graduate school is also being prepared. Our basic competences include a scientific, analytical, and synthetic multidisciplinary or interdisciplinary approach, extensive knowledge and experience connected with compiling databases, designing thematic maps and graphic material, and preparing various publications. Our research teams consist of researchers and technical and specialist advisers with a high level of responsibility that maintain strong and diverse contacts with the international research community. We are increasingly raising our profile in international circles because we have considerably increased the amount of EU funds obtained in recent years. As equal partners we have worked or are working on the Fifth, Sixth, and Seventh Framework Programmes, the Interreg IIIB Programme, the European Territorial Cooperation Programme (transnational and interregional cooperation), Cross-Border Cooperation, the Life+ Programme, the COST Programme, the Lifelong Learning Programme, the eContentPlus Programme, and the Culture 2007–2013 Programme. Academy member Peter Štih, PhD. Dejan Djokić, PhD (Centre for the Study of the Balkans Goldsmiths, University of London, London). ZRC SAZU is the first Slovenian research and education organisation to have established an International Advisory Board.